Layar, the first camera-based AR app to really blow us (or anyone) away, has quietly slipped into the App Store. As with the Android version, the app overlays all kinds of information onto a live view of the world around you. Since OS 3.1 dropped, giving devs (almost) open access to the iPhone's camera we've seen a minor avalanche of augmented reality apps hit the store; some have been interesting, like Yelp's, but most feel a little bit like tech demos. 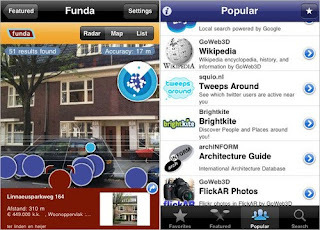 Layar, for what it's worth, has grown up since we last saw it: now you can overlay all kinds of data, from geotagged Wikipedia entries to Flickr photos to local Tweets.